This old mas is set in the midst 2 acres (6.000 m2) of olive grove with breathtaking panoramic views of Les Maures, the mountain range between the valley and the St. Tropez bay. At walking distance from the perched medieval village of Flayosc with its many shops, restaurants and bars. The house has recently been restored to a high standard with 3 bedrooms, of which 2 are on the ground floor and the third is a family bedroom on the first floor, 1 shower room with WC, 1 separate WC, sitting room with fireplace and spacious well-equipped kitchen. South-facing terrace overlooking the olive grove and a large private swimming pool (12 x 5). The property is very private - but far from being isolated. An ideal setting for a family or a group of friends sharing their holiday. The pool is situated 8-10 meters below the house. The village: Flayosc is the perfect location to relax and enjoy the beauty of Provence, only 40 minutes away from the busy tourist spots of the coast. The village offers excellent shops for food, a weekly market (Mondays), pharmacy, bank, several bars and restaurants, laundry/dry cleaner and wine cooperative. It also has a tourist office offering excellent information about the area. 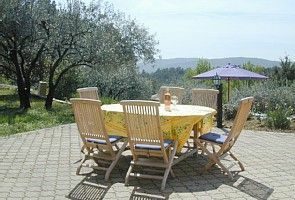 The area: The house is situated less than 1 kilometre from Flayosc, 5 kilometre west of Draguignan, 1 hour from Nice Airport. Only 40 minutes away from the sandy beaches of the St. Tropez bay and the dramatic scenery of Gorges de Verdon, the Grand Canyon of Europe. Perched medieval villages, olive mills, daily markets, wine tasting and first class gourmet restaurants. There are 15 challenging golf courses within an hour's drive. Satellite TV with over 100 international TV channels; CNN, Sky News, Euronews, CNBC etc. Broadband with wifi, free phone calls within France, both for landlines and mobile phones (French operators), plus landlines in Europe and land lines & mobile phones in United States and Canada. Initially we booked this holiday because we had a six month old baby with us and did not want to fly with him. What a wonderful choice it turned out to be. The farmhouse is in an idyllic location, set in a forest made up of a combination of pine trees and olive trees, which spread as far as the eye can see. This gives a feeling of privacy but without a feeling of isolation. There were eight of us on this holiday, six adults, a child of seven and a six month old baby. There was more than enough room for us all, a family room upstairs and two double bedrooms downstairs. The farmhouse also had plenty of room elsewhere so that we could be on our own or with others whenever we wished. We spent lots of time at the farmhouse. It has a spacious terrace outside, sheltered from the sun by trees, with dining tables and chairs for alfresco lunches and dinners which were enjoyed by all. There are also decent BBQ’s to use if you wish. The swimming pool, situated just below the terrace is a good size, long enough for a proper swim and deep enough to dive. Our seven year old learned to dive in this pool. The physical location is good too. It is about 45mins from Frejus which is a good beach resort. We went three times and had good days on the sandy beach. It is also about 45minutes from the |Grand Canyon du Verdon and the lake at St. Croix which are spectacular. We only spent one day there but wished we had taken a picnic and swimwear to really enjoy it. Be aware that there are no restaurants there and you will need to take previsions. Flayosc is a nice town with lots of places to eat and well worth a walk in for a drink or and evening meal. We often got fresh croissants from the local bakery for breakfast. As I said earlier, a wonderful choice and Flayosc is ideally situated to explore a really nice region of France. However, once you relax at the farmhouse, with the pool and the terrace you really won’t want to do anything other than relax, chill out and enjoy your holiday. We have had many lovely family holidays at this property. The pool, deck and views are fabulous and property is always clean and well maintained. The town of Flayosc is a 5 minutes drive away, with two lovely bakeries and numerous cafes and restaurants. There are always daily markets to visit in the surrounding area. Further afield there are numerous lakes to enjoy and a beautiful medieval village. The stay was very nice. The pool was about 15 meter long and always very clean. The house was very nice. We will never forget the calm and the panoramic view over the mountains. We will got back here another year. We went to Flayosc in june an spent about two weeks in Oliveraie Carasse. The pool was very nice, the house was very convenient and well furnished. The kitchen was brand new and the rest of it was recently renovated. We met Jean-Charles, who took care of the house and the garden. If there were any problem, he was there to help us. The Flayosc village with shops and restaurants was just 1000 meters away. Great house with lovely swimming pool. We had a lovely stay in this beautiful house. It was well suited for two families with a large and well equipped kitchen and the big garden. The big terrace made for some very cozy evenings by the grill with the singing cicadas in the background. Wonderful and peaceful villa with stunning view and luxury living by the pool. We found this place perfect for a relaxing and remote holiday. The house is well kept, spacious and comfortably cool even during hot days. The garden and the view over Provence mountain is stunning. And the pool - that's the icing on the cake that makes this a perfect vacation! The little village Flayosc is very charming and picturesque. There are plenty of restaurants which are of good quality at modest prices. We can really recommend this place if you want a relaxing and luxurious holiday! Flayosc is located 5 km west of Draguignan, 90 km west of Nice International Airport, 40 minutes by car to the St. Tropez bay and 40 minutes to the St. Croix Lake and the Grand Canyon of Europe. N.B. The first week of July is still available and the all inclusive rent has been reduced to €1,500 (from €1,690).